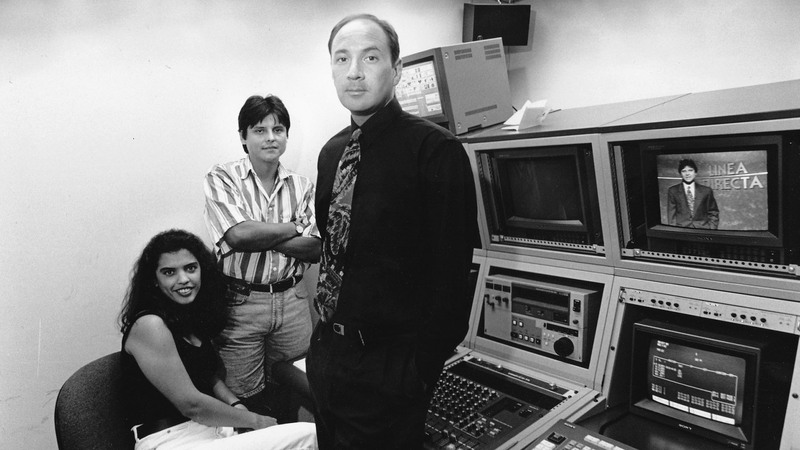 Lorena Sabogal, production assistant, Arturo Salcedo, host, and Eduardo López, producer, at the studio where they produce the public service television series, Línea Directa (1995). The video clip shows a Latina riding in a car through Mount Pleasant, with her small daughter perched happily on her lap. Suddenly, the scene shifts to another front seat, where the dummies of a woman and a little girl are hurled into the windshield of a crash-test car at 30 miles an hour. The message could not be more graphic, but it is one many Latino immigrants in the area have never seen or heard explained in Spanish until now. To make sure the lesson sinks in, the next scene is an interview with a middle-age Salvadoran man named Mario Rivera, his face recognizable to all his Mount Pleasant neighbors. Eight months after losing its District government funds and disappearing from view, “Linea Directa” — the only Spanish-language public service television show in the Washington area — has fought its way back onto the air. The return premier, which was shown Saturday night on Channel 48 (Univision), focuses on traffic safety; similar half-hour segments will appear at 6 p.m. Saturdays. The struggle to save “Linea Directa” has been grueling for its longtime co-producers, Eduardo Lopez and Arturo Salcedo. For five years, they operated out of the D.C. Mayor’s Office on Latino Affairs, producing 50 low-budget but popular shows on topics ranging from AIDS prevention to fraudulent psychics. Local Latinos acted in dramatizations, presented testimony and asked audience questions. Then last winter, both men lost their jobs to the city’s budget cuts, and their program was canceled. But Lopez and Salcedo, determined to save the show, formed a nonprofit corporation and started banging on doors for support. Gradually, the team pulled together a patchwork support system, including an agreement with the Office on Latino Affairs to provide a $1,500 monthly contribution and official sponsorship, a low-rent studio at St. Paul’s College in Northeast Washington and pledges of production funds by several foundations and agencies. Each show can cost as much as $30,000 to make. So far, the money has not stretched far enough to pay either man a regular salary. Lopez is living largely on his severance pay from the city; Salcedo is glad his wife works. Previously, the OLA funded both men’s salaries — a total of about $80,000 — and they raised outside production funds. For the last month, Lopez and Salcedo frantically have been preparing the auto safety feature: finding accident victims, shooting street scenes, taping voice-overs in a broom closet and editing tape on a console that barely fits in their cramped studio. Last Thursday, they edited until dawn to meet their first deadline. Local nonprofit agencies have strongly supported “Linea Directa’s” return. The auto safety program was paid for with a grant from Mary’s Center for Infant and Maternal Care in Adams-Morgan, which obtained the money through a national auto safety foundation. There is a more ambitious plan for a fall series on preventing heart disease, funded by the National Institutes of Health. And, if sponsors can be found, the team wants to produce programs on teenage drug abuse, street gangs, changes in immigration law and rights of Latina women. Lopez and Salcedo plan to continue their successful focus-group format, in which local Latinos are consulted in advance so the programs reflect community concerns and level of knowledge, rather than relying on specialists.